It fascinates me how quickly the fashion industry is turning to technology. There are new apps popping up daily, each with new features and one claiming to be better than the other. Most of these are geared towards shopping the looks of style influencers, but few dig deeper. Why not give women and men the tools to effectively style themselves in what they’re comfortable in, rather than blindly following a trend? Doing exactly that is a new series produced by Simon Malls in collaboration with Glamour and GQ Magazines called LOOKBOOK Live. Each LOOKBOOK Live event features a stage for panel discussions and styling challenges, as well as a beauty bar and a fashion lounge. In addition, every attendee gets the opportunity to chat style and trends with local fashion influencers, Kiersten Geiger of Glamour and Sabir Peele of GQ. The premise of LOOKBOOK Live is to foster an interactive environment where fashion is attainable for everyone. By setting examples for recreating trends in real life and providing virtual style consulting, Simon Malls’ series is effectively changing the conversation about what it means to be fashionable. KD: Tell me about the LOOKBOOK Live series! What does it have in store for us? KG: This is the second event so far and it goes until November, so right now it’s all about introducing people to Fall trends and teaching them how they can fit those to their body. 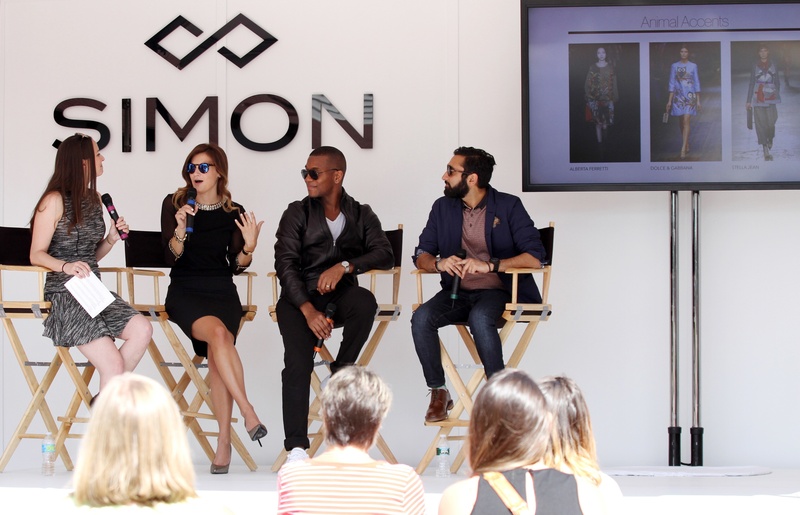 Glamour, GQ and Simon Malls are three fashion power houses that are teaming up to promote style, trends, and fashion in a social, interactive way. We are really excited! KD: What are some hot beauty trends for this season? Do you see them aligning with the fashion trends? KG: It’s all about making a trend work for you. Not everyone wants to go full force into a trend. By guiding them through our tents and displaying how trends can work for their skin tone, body and style, it makes it fun for everyone! Right now orange is a really popular color for fall fashion. Also, gunmetal and grays are the hottest beauty trends going into fall. You can easily tone down both of these trends (or play them up!) based on your tastes. KD: What are some of your favorite places to shop champagne trends on a beer budget? KG: Definitely H&M! They just absolutely nail it every time. Especially recently, their clothing just completely encompasses what people want in fashion right now. Gap is also doing a great job with denim! They’re so intuitive of their market and their brand; they really listen to customers.